The “Israeli” entity’s so-called “Supreme Court” has unanimously rejected two petitions brought by human rights groups demanding the entity’s army to stop using snipers and live ammunition against unarmed Palestinian protests in the Gaza Strip. The panel of three justices on Thursday sided with the “Israeli” military, which argued that the protesters constituted a real danger to “Israeli” soldiers and settlers. The “Israeli” entity maintains its forces use of live fire at demonstrators in the Gaza Strip. The court’s ruling gave the entity “a green light to its continued use of snipers and live fire against Palestinian protesters”, Adalah – The Legal Center for Arab Minority Rights in the “Israeli” entity and al-Mezan Center for Human Rights, which filed one of the petitions, said in a statement on Friday. “The ‘Israeli’ Supreme Court completely ignored the broad factual basis presented to it by the petitioners, which includes multiple testimonies of wounded and reports of international organizations involved in documenting the killing and wounding of unarmed protesters in Gaza”. The human rights groups said the court “refused to watch video clips documenting ‘Israeli’ shootings of demonstrators and, rather than actually examining the case, fully accepted the claims presented to it by the state. “The extreme nature of the ruling is also highlighted by the striking absence of any mention of the casualty figures that had been presented to the court”. Yesh Din, one of the “Israeli” groups that brought the other petition, also criticized the court’s decision. “The judges missed an opportunity to prevent the continuation of the killing and injuries,” it said on Twitter. 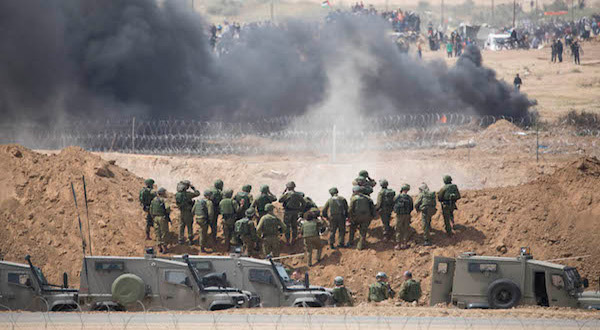 Since the protests began, “Israeli” forces had martyred at least 113 Palestinians, including women and children, and wounded more than 12,000 people. UN rights experts denounced the entity for using a “disproportionate use of force”, while Amnesty International called it a “horror” that violated international law.